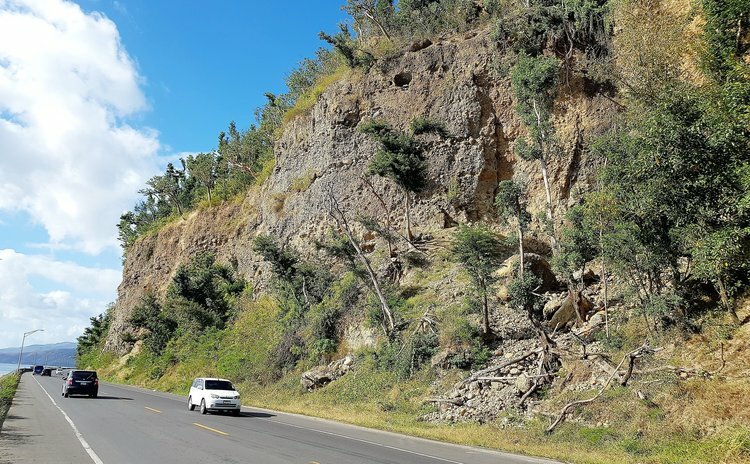 Not so long ago in the wee hours of February 18th, a massive section of the Canefield Cliff gave way, narrowly missing a passing motorist. This near catastrophic event, as your newspaper correctly observed, was the second of its kind in the space of four months, the more recent having occurred on October 26th 2017 in full, broad daylight. Subsequent to that latest incident, there was a flurry of activity as excavation and dump-truck operators worked feverishly to clear the debris. While operations have long since been suspended, a humongous bolder which was in the process of being dislodged from a ledge, remains, to date, on its lofty perch, with ropes still attached. Very hopeful news of government's intention to promptly acquire land at Morne Daniel in order to construct a bypass as well as forthcoming assistance from a French company to address the danger posed by the Canefield Cliff was heard by the entire nation. But any further updates on these plans remain to be heard. In the meantime some more unstable areas clearly visible to anyone who looks upward continue to pose a serious threat, given the conclusion by some authorities that the cliff is waterlogged. Will it take another big one, this time with injuries or casualties (Yah forbid) to jumpstart the requisite operation on the part of government? Such a probability is not at all a question of if but when. I would hate to think that the tendentious malaise of delay and complacency in relation to the issue of this Canefield Cliff will, as in the past, be raising its ugly head once again. In the meantime the general public has apparently become relaxed about this Sword of Damocles hanging over their heads. Nevertheless may the Mercies of the Living God through the prayers of the saints in the land prevail to avert disaster.